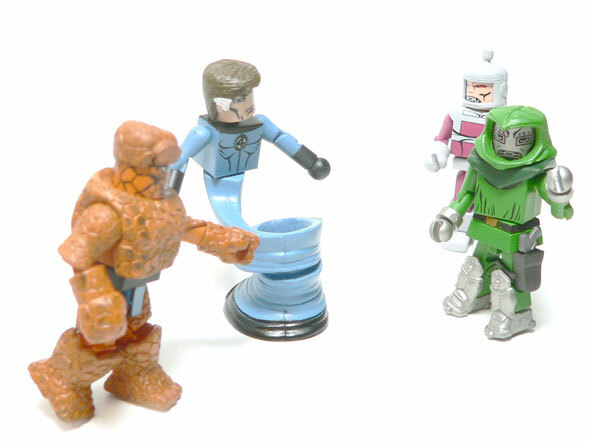 I’ve said before that I’m not a huge Fantastic Four fan, yet I bought some more FF Minimates. 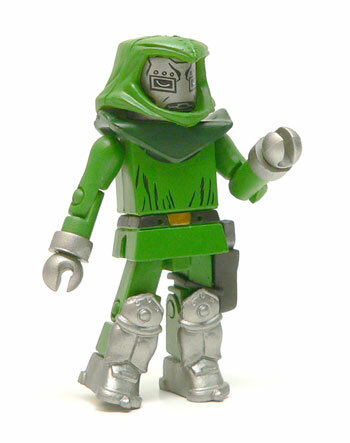 I’ve always like Dr. Doom, and he’s what sold me on getting this marked down set. 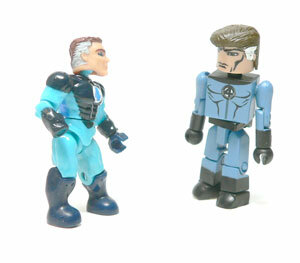 You may remember that not all that long ago I reviewed the blind bagged MegaBloks Mr. Fantastic. I was bit underwhelmed with him. So part of me wondered if the this version would fare much better. Considering he’s a guy in a body suit, it could have went either way. It probably helps that the look for this series is more towards the 80’s than the modern looks. I’m especially pleased with his face. It really has that old fashioned inked look. He also has that constipated concerned scientist look nailed. Honestly, I can’t see myself displaying him with the regular legs. The base takes him from guy in bodysuit to Mr. Fantastic. Poor misunderstood Doom. Nobody wears a a mask because they want to. Actually, Doom comes with two heads and one is, uh, not pretty. There’s a number of folks this could stand in for, but it works well here. There’s quite a bit of paint on it for a Minimate and it all looks good. Again, they really managed to evoke the inked look of a comic book with him. The silver head looks great in combination with the included hood pieces. 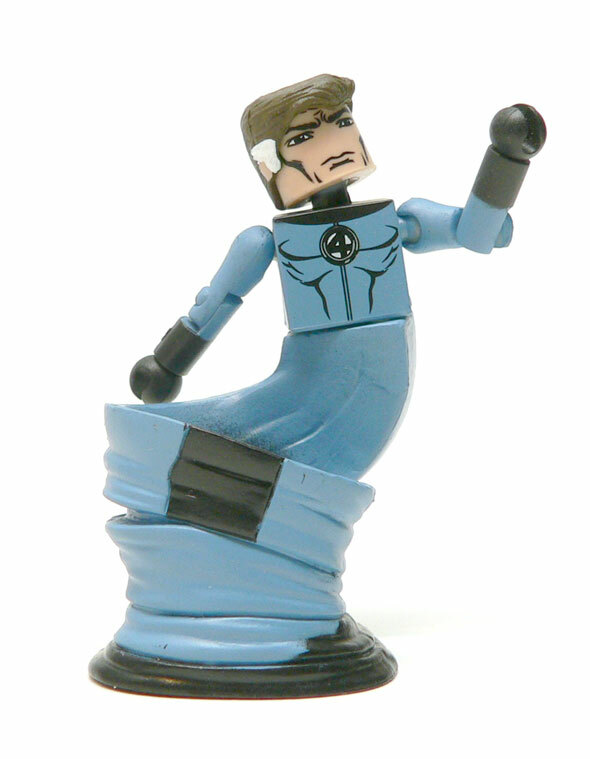 While he doesn’t have Doom’s trade mark flowing cape, the extra pieces more than make up for it. He’s got the hood and shoulder pieces, a small skirt piece, a holster and funky feet with shin armor. Put them all together with silver and green paint and this guy makes a pretty good Victor. He’s even got a tiny pistol to wreak havoc with. The green is a bit brighter than I would have expected. To be honest, I think I dig him so much because he really reminds of the vintage Secret Wars figure. The only thing I would have maybe changed is making the legs and arms completely silver. But, that is pretty minor. I got this set fairly inexpensively, so I really wasn’t expecting much. That said, I’m more than pleased. 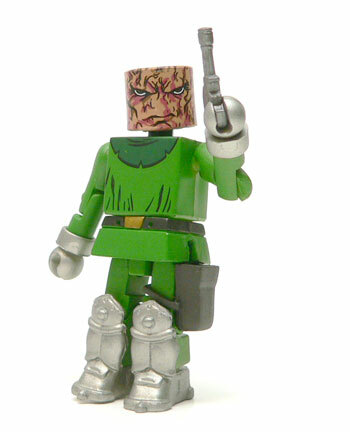 I love having a little Dr. Doom on my desk to shake his fist at people that tick him off. And this Mr. Fantastic more than makes up for the disappointment of the MegaBloks one. REally like the figure though, and I agree that he is reason enough to the 2-pack. Has there been an unmasked Zemo? 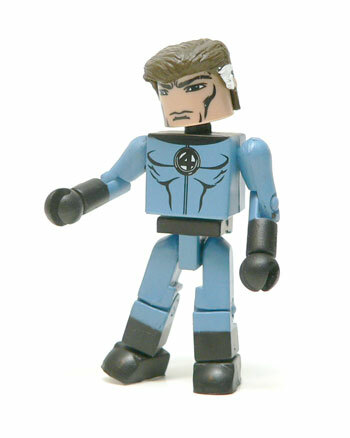 Stop trying to tempt me into buying Minimates! If I have to get them, you do too!